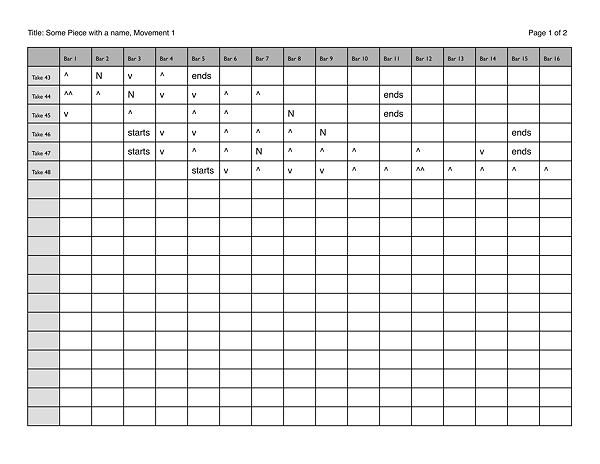 Lockwood ARS Downloads - Useful, free material for planning and executing Recording Projects. In some browsers, you may need to right click on the link, and then select "Download" or "Save Link As..."
I wish I could take credit for this method, but the idea came from pianist, Allen Reiser. It's a solution to the problem of wanting to jot down comments while reviewing takes, but winding up with a score that is all but illegible because each comment must also include some indication as to which take it refers. An added issue is that while time is spent concentrating on writing a comment, focus on the music is lost, requiring more repetitions for thorough analysis. The goal is two-fold: to provide a suitable receptacle for comments that makes it extremely clear which comment is attached to which take, and to establish a form of code - quick, easily made marks that can be jotted down without losing concentration on the music. The first step is to set up your playback so that you can easily audition a number of takes, allowing you to quickly and easily compare the same passages in each. Recording sessions usually have a few takes that cover the whole piece or movement, and then several shorter takes covering problematic sections. It can be helpful to have some idea where and when the material in each take falls in work as a whole. My recommendation is that you use Apple's Quicktime - a free utility available for both the Mac and Windows operating systems. 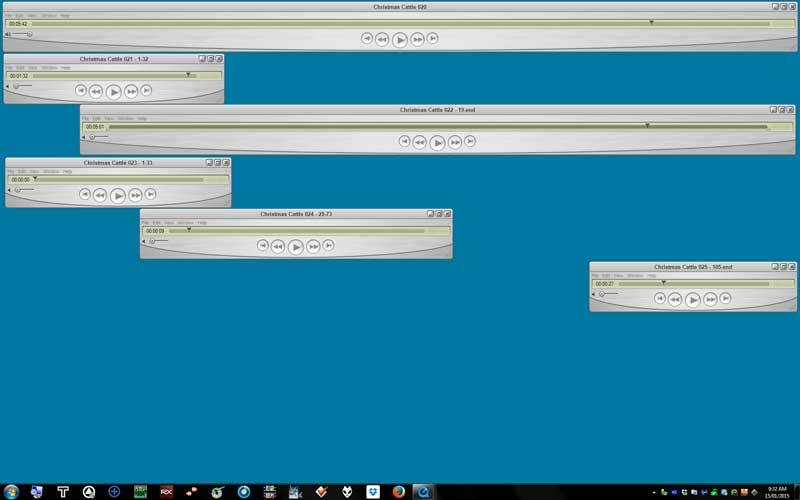 Quicktime allows you to have several files open on your desktop at the same time, and moreover, you can change the horizontal size of each player window. With this feature, you can stretch a complete run-through across your computer screen, while shorter takes can occupy the rough duration that they cover, and be positioned so that you have a vertical alignment of the music across all your takes. Once that's set up, you can start playing one file, then quickly jump to another one, or audition the same passage from several takes in quick succession. Quicktime only allows one player to be active at a time, so just clicking on the time line bar in each window will start playback from that point, while muting whatever was being played previously. 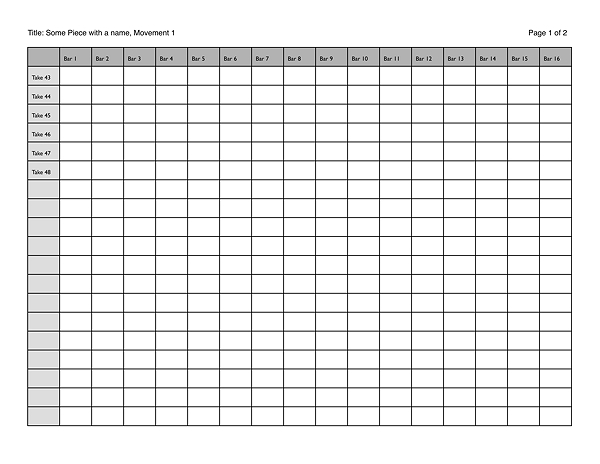 To begin making a record of your impressions of the takes, first print out the blank chart enough times so that you have a horizontal division for each measure of music. Each horizontal line then becomes dedicated to one individual take, with the bar numbers for all the takes lining up vertically. The decision to make one line per take and one box per measure is arbitrary. 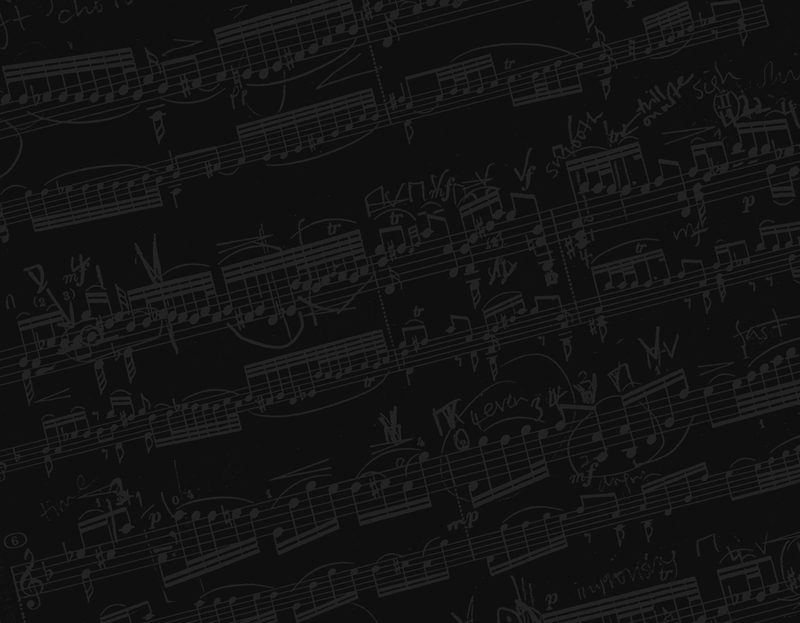 If you only have a few takes, you can save some paper and use the upper half of each page for sixteen measures, and the lower part for the following 16 measures, and so on. Also, don’t be tied to the “one box per measure” scheme - if you need finer resolution, by all means have each box represent a single beat in a measure. 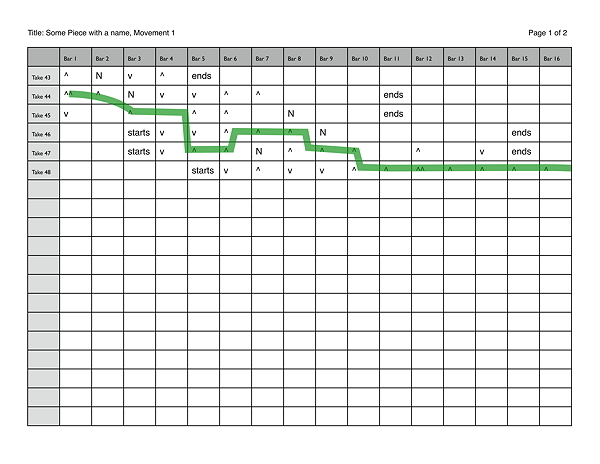 Make the chart work for you, not the other way around. The best, most inaudible edits occur in the places where a listener will be least likely to hear them, so choosing transition points is key. Putting an edit right on the dividing line between musical phrases or sections is almost always audible -- it’s much better to hide the transition inside something busy. It's easiest to edit at a point where the music shifts abruptly from soft (or silent) to loud. The most difficult edits occur at points where the music goes from loud to soft, as it’s very difficult to maintain the same ambience and reverberation, and the shift in ambience is almost always audible. Similarly, “cold starts” are to be avoided, where you have a take which starts in the middle of the music, and you place the edit right on its very first note. Since this take contains no overhanging reverberation caused by performance prior to this point, but the take onto which this one is to be joined has the ambience is fully active, the edit will sound like all the air was suddenly sucked out of the room when the prevailing reverberation suddenly stops -- VERY audible. Once you’ve figured out where and when to edit, you need to transfer this information to a score, so I can edit while following the music. 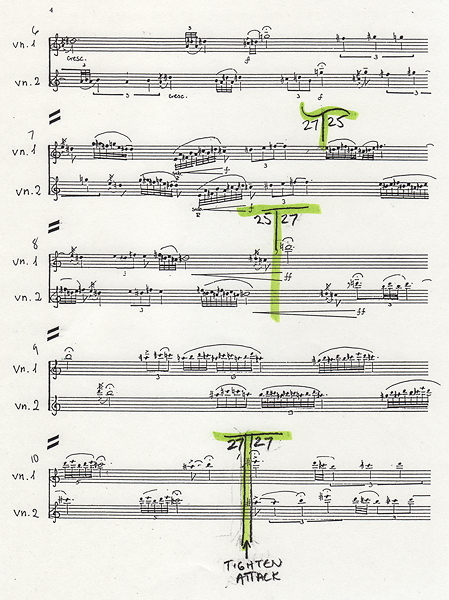 The notation I prefer is to draw a large “T” through the music, where the vertical stem of the “T” passes through the notated music at the point where the edit is supposed to happen. Then - and this is crucial - write the number of the take that we’re moving FROM in the area just under the horizontal crossbar of the “T” to the LEFT of the vertical stem. Then, write the number of the take that we’re moving TO in the area just under the crossbar in the area to the RIGHT of the stem. When you’ve finished, you can check your work by making sure that all the “To”s become the following “From”s -- 86 to 24…, 24 to 43…, 43 to 19…, etc. etc. A slight variation is to make the crossbar of the “T” somewhat wavy in shape when there is some latitude in where to place the edit. This reserves the straight crossbar for those instances where the edit absolutely HAS to be at the point notated.